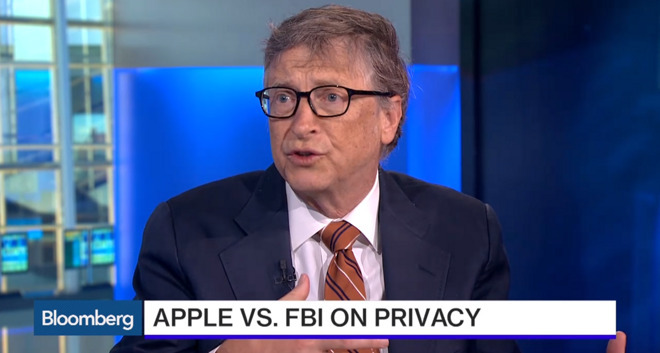 Microsoft co-founder Bill Gates says he was taken aback by a recent report quoting him as supporting the FBI in its encryption battle with Apple, calling the oversimplification of his view on the controversy "disappointing." Gates spoke with Bloomberg TV to clarify his stance, disputing an earlier report that said he sided with the FBI. Instead, Gates said the issue involving the San Bernardino, Calif., terrorist attack and a locked iPhone 5c is complex, and warrants discussion. "I was disappointed cause that doesn't state my view on this," Gates said. "I do believe that with the right safeguards, there are cases where the government, on our behalf, like stopping terrorism, which could get worse in the future, that that is valuable. But striking that balance--clearly the government has taken information historically and used it in ways we didn't expect, going all the way back to say the FBI under J. Edgar Hoover." The former Microsoft CEO said it should be possible to implement a series of "safeguards" that would prevent federal investigators from being "completely blind" in cases where obtaining information is warranted. But Gates refused to officially take a side on the matter, saying that the U.S. court system will ultimately have the final say. "You don't want to just take the minute after a terrorist event and swing that direction, nor do you want to in general completely swing away from government access when you get some abuse being revealed," he said. "You want to strike that balance that the United States leads in setting example." Earlier, Gates had been quoted by the Financial Times as saying the San Bernardino terrorist attack was a "specific case," and that the FBI was not asking for "some general thing" from Apple. But Gates took issue with the way his comments were represented. The mostly neutral stance from Gates stands in contrast to companies like Twitter and Facebook, who have more actively voiced their support for Apple in opposition to the U.S. government. Other high-profile endorsements have come from Mark Cuban and John McAfee, who have expressed concern over the power the government could wield if it were given "backdoor" entry into mobile platforms like Apple's iOS. The controversy reached a boiling point a week ago, when a U.S. magistrate judge ordered Apple to comply with FBI requests to help extract data from an iPhone owned by one of the shooters involved in the December terrorist attack in San Bernardino, Calif. The device in question is an iPhone 5c that was password protected by the gunman, and is set to erase a stored decryption key after ten unsuccessful login attempts. Apple Chief Executive Tim Cook responded with an open letter, saying that the creation of a backdoor tool to access a locked iPhone could open the flood gates for future issues, rippling well beyond the investigation into the San Bernardino shooting. The terrorist attack resulted in 16 deaths and 24 injuries. Apple has appealed the U.S. magistrate judge's ruling, and has until Friday to respond.